I have recently discovered audio books. This is my main method of "reading" lately. Christian Audio is offering another free book in the month of March (for the other free books currently offered, check out this post). They are running a special on several Christian classics, such as The Imitation of Christ, The Confessions of Saint Augustine, Paradise Lost and more for only $2.98 each. 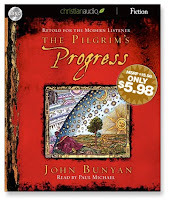 To promote these classics, they are offering a free download of a new abridged version of Pilgrim's Progress, retold for the modern listener. To take advantage of this free offer, use coupon code PROG103. I will be adding Pilgrim's Progress and possibly a few more classics to my "reading" list this month.